Located on the Horn of Africa, the Republic of Djibouti shares borders with Somalia, Eritrea and Ethiopia. The country sits on the Bab el Mandeb Strait, which separates the Red Sea from the Gulf of Aden. Djibouti gained its independence from France on June 27, 1977, but keeps close ties with the European nation. More than 75% of its population lives in urban areas. Population: According to the CIA Factbook, the estimated population for July 2012 will be 774,389. The entire country is almost as big as the state of Massachusetts. Languages: Most Djiboutians are multilingual; Arabic and French are the official languages of Djibouti, but Somali is the most widely spoken language. Afar is spoken in the Afar areas. Religion: 94% of the population is Muslim, while 6% is Christian. the Somali and Afar tribes were the first on the continent to adopt Islam. The French became increasingly interested in the area, then named French Somaliland, after the Suez Canal opened in 1869. Trade flourished, and a new Franco-Ethiopian railway further increased trade relations. France struggled to maintain control of the region; after reorganizing, the colony was almost completely self-governed in the late 1950s. In 1977, the colony became the Republic of Djibouti, and Hassan Gouled Aptidon was elected the first president. Djibouti still remains close to France, which provides economic aid and security. Djibouti is the headquarters for the European Union’s “Atalanta” naval task force, which aids in the fight against piracy off the coast of Somalia. Economy: With few natural resources and little industry, Djibouti relies heavily on banking, telecommunications and trade. Due to its ideal location and status as a free-trade zone, Djibouti is considered to be the trade hub in the Horn of Africa. It is quite reliant on imported consumer products. The Djibouti-Addis Abba railway is a crucial source of revenue for the country, especially since more than three-fifths of Djibouti’s workforce is unemployed. Relationship with the United States: Djibouti has maintained a healthy relationship with the United States since its independence in 1977. The U.S. has been instrumental in providing humanitarian aid to the country, particularly in famine relief. In 2002, Djibouti agreed to host an American military presence of about 2,200 at Camp Lemonnier, a former French base. The USAID’s Food for Peace program has a warehouse for pre-positioned emergency food relief in Djibouti. It is the only one of its kind outside of the continental United States. Those are distinctions countries in the area would like to see go away. 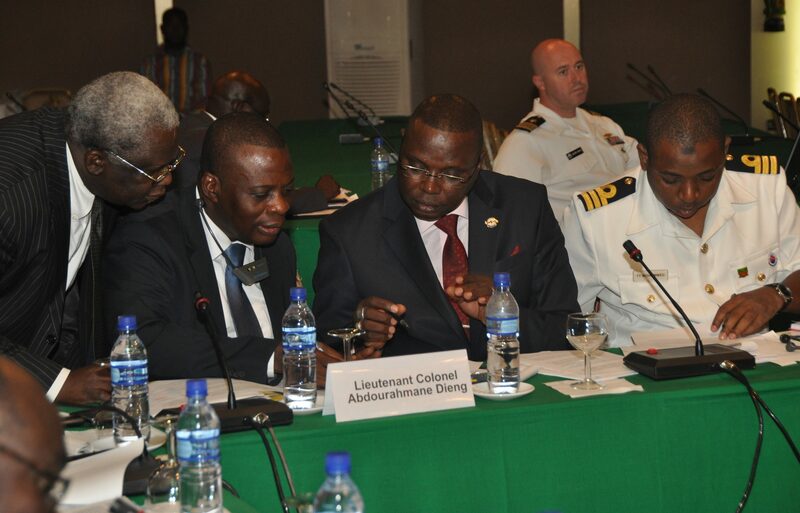 This week in Benin, member states of the Economic Community of West African States and the Economic Community of Central African States discussed how to prevent piracy, smuggling and other security challenges affecting the region’s waterways and commercial trade. The two groups, plus experts and representatives from outside organizations, met for two days at the annual Maritime Safety and Security Seminar, hosted by U.S. Africa Command and the Africa Center for Strategic Studies. In October, the United Nations passed resolution 2018, which encourages the affected states to work together and also calls for more international aid and a UN assessment mission. Also last year, Nigeria and Benin launched joint sea patrols that resulted in the arrests of at least eight alleged pirates. The seminar built on previous meetings and continued the effort to cement an agreement between the West and Central African states involved. Col. Austin Anyalechi, a Nigerian Army engineer and his country’s defense attaché to Cotonou, said collaborative efforts like those emphasized at this week’s meeting are key to preventing maritime crime and security threats. “All efforts have been made by individual nations, but no single nation can combat the problem of piracy alone,” Anyalechi said. “That’s why it calls for the need for synergy. So, with the two economic communities coming together under this kind of arrangement, I am very optimistic that it is actually going to yield the desired result of curbing the menace of piracy and sea robbery, and other related forms of maritime insecurity. Note: Staff Sgt. Olufemi Owolabi, U.S. Africa Command Public Affairs, reported this week from Benin. Click here to read the entire story.